The Great Hall is approached by way of a grand staircase, the Hogarth Stair, the walls of which were decorated by William Hogarth (1697-1764). Although often referred to as murals, they are in fact canvases. Hogarth was well-known at the time for his paintings and engravings. His artworks were studies of everyday life, perhaps more accessible in this regard, and commonly resembling caricatures. The Pool of Bethesda. Image courtesy of Barts Health NHS Trust Archives & Museums. 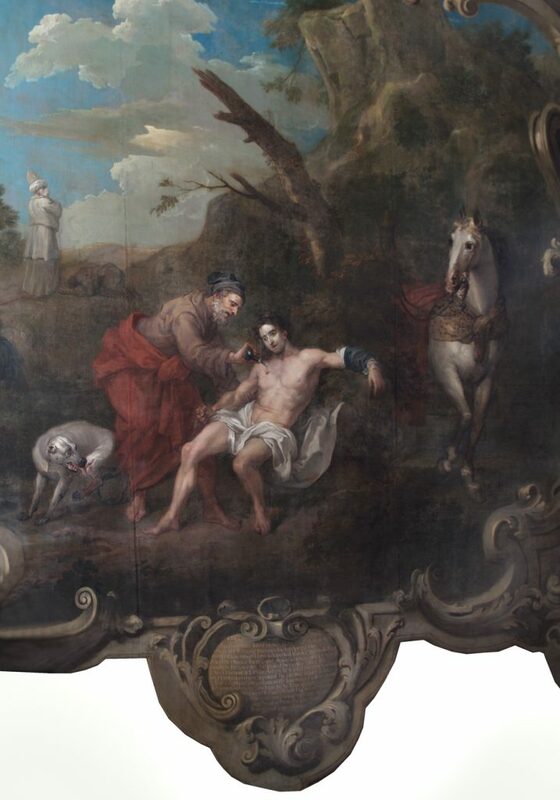 The Pool of Bethesda was started in a studio in St Martin’s Lane before being hung on the staircase in 1736, whilst The Good Samaritan, completed in 1737, was painted on site, with scaffolding erected so that the artist could reach the full height of the canvas. Engravings of these magnificent pieces seldom do the originals justice. If only for the sheer scale, they need to be seen in person, and in context, for their full effect. 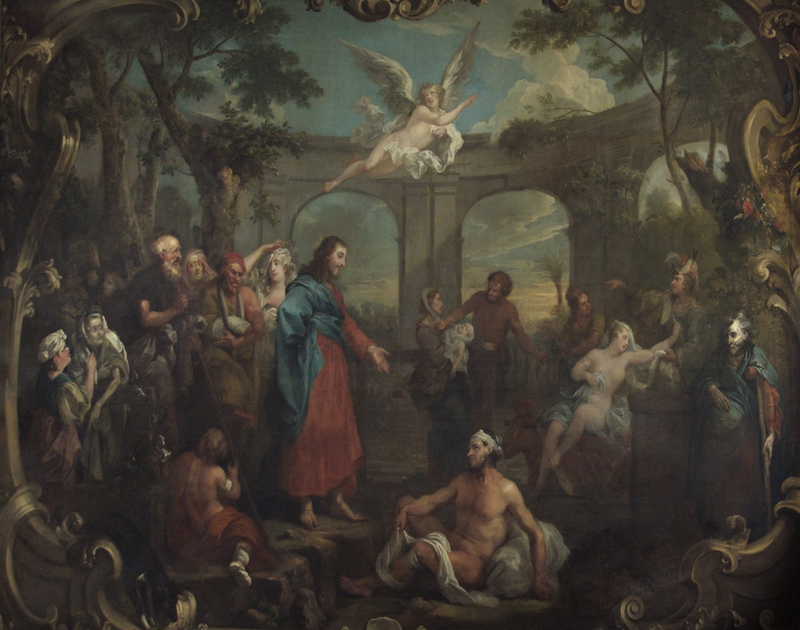 The arches and landscape that surround the pool, where the sick have gathered to be cured by Jesus, are strongly reminiscent of Italian art of the same period but the individuals depicted are strikingly original and the portrayal of Christ is often considered to be one of great dignity. This might be explained by the fact that although we know that the figures were painted by Hogarth, George Lambert – who made his name from painting scenery at Covent Garden – is thought to have painted the landscape in the later painting, and possibly in both. These invaluable works of art need protection and ongoing care. Twelve years after their completion, it is noted in the Governors’ minutes that they were already in need of cleaning. This entry in the minutes determines that Hogarth was to be consulted as to how this would best be done. The artist had them cleaned at his own expense two years later in 1751. Hogarth had specifically requested that the completed canvases never be varnished. Unfortunately we know that nobody listened, as when they were cleaned in the 1930s, seven coats of varnish were removed! As an indication of how much dirt the paintings accumulate, when they were again cleaned in the 1960s it was only then that the inscription in the foundation stone in the second tableau was discovered. The paintings are still used as an educational tool as the characters portrayed are thought to be patients from the hospital, many of whose conditions are recognisable to the trained eye. None of the illnesses are exaggerated, perhaps unusually for an artist known for caricatures, and reflect a handful of illnesses that would have been seen regularly at the hospital at the time. Detached from these figures, at the top left of the painting is a man with gout, whose arthritic and sore hand seems to have been accidentally hit by the cane or staff of the blind man next to him. Behind and in between these two is a character that has always been thought to be suffering from jaundice. More recent observations have suggested that the diagnosis is melancholia or major depressive disorder. A good doctor will tell you that jaundice and depressive disorders are common together and that one is certainly not exclusive of the other! Also in this group is a woman with an inflamed breast, again possibly a reflection of his connection to Freke who had written on breast cancer and its surgical treatment, whilst others have suggested she is suffering from mastitis. The left of the painting depicts obesity and emaciation, or hypertrophy and atrophy, in a young girl and an elderly woman respectively. At the feet of this group to the left is a young man. His prominently curved spin, crutch and bandaged limbs have led to suspicions that he might be suffering from rickets. On the right hand side of the painting is another group. To the far right, bathed in light, seemingly from the buildings own windows, is an elderly man that doesn’t look at all well! This unfortunate chap has been the subject of varied clinical observations over the years. Some have explained his crutch by way of a tuberculous arthritis of the knee, whilst others have paid more attention to his swollen tummy. The latter observation may be ascites, which occurs in a number of different conditions but here has been attributed to cancer of the liver or a disseminated malignancy, called carcinomatosis. To his right is a poorly attired young woman. The general state of undress of this young lady and her wanton pose, has led many to assume that she is not only a prostitute but potentially modelled on a famous one of the time! Regardless, she seems to be someone of means as her maid appears to be providing the tough looking gentleman at the back with financial recompense for restraining the lady with the baby, so that her mistress can get in front of her in the queue. There is not a huge amount to go on in terms of a clinical examination here, however, there is the suggestion of psoriasis affecting her knees and one elbow, which combined with a possible arthritis of one knee and her chosen profession, might point to a diagnosis of gonorrhoea. The Good Samaritan. Image courtesy of Barts Health NHS Trust Archives & Museums. The Good Samaritan depicts the biblical story with the Samaritan pouring oil and wine into the wound of the injured man, a first century practice that continued untll the 16th century. In the foreground, Hogarth has added a dog licking a wound on its leg, presumably sustained during the traveller’s attack. In the background, we can see the priest who, having ignored the victim at the side of the road, has continued on and now has a man lying prostrate at his feet. Rahere also appears, asleep and dreaming alongside a tableau of the laying of the hospital’s foundation stone and the depiction of a sick man being carried on a stretcher into the old cloister of the hospital, where he is met by the brethren of St Bartholomew. The depiction of the old cloister is probably accurate as, having been born and raised in Smithfield, Hogarth would have seen it for himself when he was younger, before it was replaced. The decorations surrounding the canvases were added by Hogarth’s students and include the medallions of Galen and Hippocrates and baskets of flowers. These embellishments frame the canvases in a more typically Georgian style. The Grand Staircase is part of the weekly historic tours of the hospital, which take in the church of St Bartholomew the Less and the hospital’s square, North Wing and Great Hall (subject to availability). Find out more. The Hogarth Stair. Photo © David Butler.